Your natural stone can provide you with a lifetime of beauty and pleasure, provided it's properly cared for. Stone is unique and unlike any other surface, it requires special care. Stone is one of the easiest surfaces to maintain. In fact, granite rates as a 7 on the Mohs hardness scale of 1 to 10, making it virtually unscratchable. 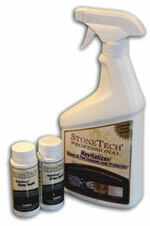 At Granite Tops, we recommend and sell "StoneTech" products. "StoneTech" Professional is a unique system of world-class innovative chemical technologies specifically designed for superior protection, care and cleaning of grout, natural stone, ceramic tile and masonry surfaces. Clean stone surfaces with a few drops of neutral cleaner or stone soap (available at Granite Tops). Reseal the countertop every one to two years. Use a non-toxic sealer on food preparation areas. We have a large selection of stone cleaners and sealants to help your new counter top last a lifetime. Below is a listing of products we have available. Please check back soon for online ordering.